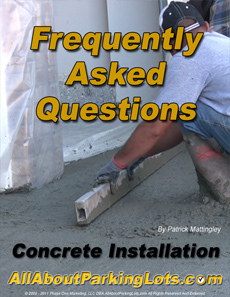 Here are some of the most frequently asked questions about concrete parking lot installation. If you have a question that hasn’t been answered, please ask a question in the comments box below or Contact Us Here! I Need A Brand New Concrete Parking Lot, Where Do I Start? How Much Will A New Concrete Parking Lot Cost? Should A New Concrete Parking Lot Crack? How Thick Should A Concrete Parking Lot Be? Should A Base Be Installed Prior To Installing A New Parking Lot? How Important Is Drainage Planning?